City Council Speaker Corey Johnson began his first round of Council staffer firings last Friday, gutting the public tech division — a unit created under the previous speaker and the only unit in the Council to be headed by a Latina woman. Several sources confirmed to POLITICO on Monday that at least 10 Council staffers received pink slips last week including Erica Gonzalez, who served as senior adviser under former Speaker Melissa Mark-Viverito and headed up the public tech unit. Before her time in the Council, Gonzalez — who collected a salary of $141,713, according to city data — worked as El Diario’s executive editor and as director of communications for the mayor’s Office of Immigrant Affairs during the Bloomberg administration. The round of layoffs also includes Jazmin Chávez, who formerly served as deputy director for public technology and digital strategy; Lauren Quiñones, who served as assistant director for the unit; and Juana Ponce de León, who served as director of media diversity and relations. The Council’s public tech division was a unit first created under Mark-Viverito as part of an effort to modernize the Council, increase outreach to communities of color and increase participation among communities typically less involved in civic activity. The unit was formerly made up 10 staffers, with six now remaining. It’s not yet clear if the unit will be preserved under Johnson’s term, but earlier this month, when he announced committee chairmanships and leadership positions, Johnson said the Council’s technology and digital communications efforts would be led by the a “deputy leader for digital communications” — a newly created post given to Council Member Rafael Espinal. Robin Levine, a spokesperson for Johnson, characterized the layoffs as routine, saying every new speaker is expected to reshuffle staff shortly after they take office. Members of the Council, who would only speak on background, pointed out that Johnson’s first round of layoffs targeted four Latina women. Others said the tech unit was a group created under, and loyal to, the previous speaker that was bound to get cut under the new regime. The question of ethnic and gender diversity has been a sensitive one in the Council in recent months. Johnson’s front-runner status and eventual victory drew criticism from some of his opponents and other members as he is a white man leading a body that is roughly half people of color. Johnson has said he will make diversity and inclusion a key part of his tenure and agenda, but he’s faced criticism over gender and ethnic diversity in hiring during his four years prior to being elected. According to data gathered by the National Institute for Latino Policy, of the 926 staff members in the City Council, 195, or 21.1 percent, were Latino in 2017, although that number includes elected Council members. According to the group’s data, women made up 52 percent of total Latino Council staff. The layoffs also included former community liaison staffer Jennie Berger, the wife of newly elected Council Member Kalman Yeger. Berger, who was “asked to resign,” according to sources, served as a liaison in the Council. She was in charge of helping members work with certain committees and was heavily involved in affairs related to the Jewish community. Several Council sources said the firing was seen as a retaliatory move by Johnson. Yeger was a supporter of Council Member Mark Levine in the speaker’s race. Jennifer Wilcox, who served as assistant deputy director for infrastructure, was also let go this week. Layoffs are somewhat commonplace following the election of a new speaker. Previous speakers, including Christine Quinn and Gifford Miller, laid off dozens of staffers in mid-February. One particular round of layoffs affected so many staffers it became known as the “Valentine’s Day Massacre” after Quinn laid off 61 staffers in 2008. Miller laid off 66 in 2002. As we have explored the problem of Latino underrepresentation in New York City government employment, one agency we have had difficulty getting useful information is the City Council. A database compiled by SeeThroughNY makes it possible for us to at least get a glimpse into the composition of their payroll. The latest employment data from the city for 2017 found that Latinos are 19.7 percent of the municipal workforce, despite being 27.2 percent of the city’s overall labor force. 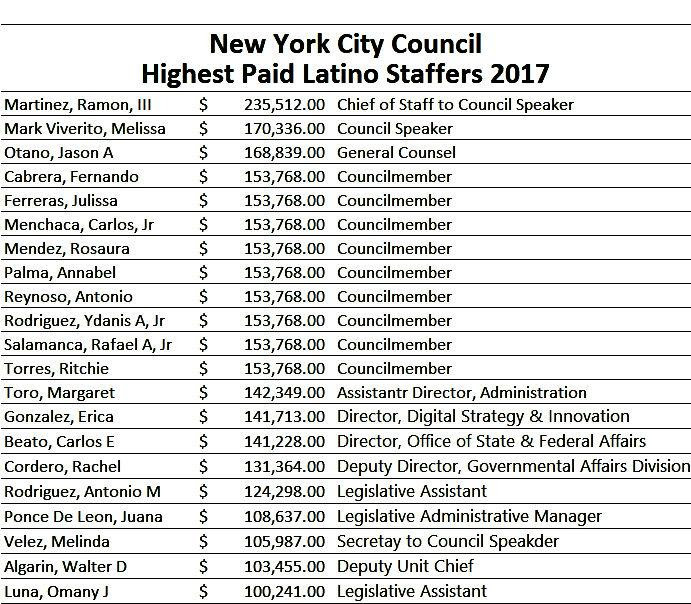 From these data it was not possible to break out the City Council numbers since they were buried in a functional code labeled “Other.” The SeeThroughNY data on the City Council payroll provides very limited information, but at least allows a first look at Latino representation on the staff of this important legislative body. 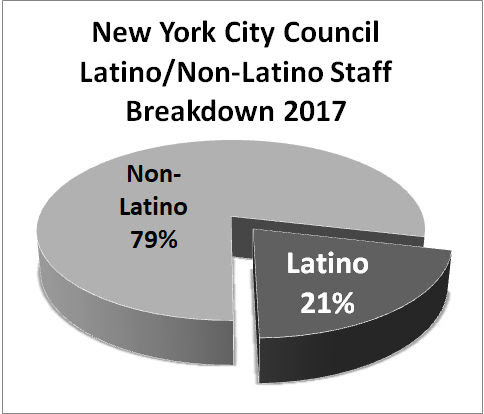 In 2017, of the 926 staff members in the City Council, 195 or 21.1 percent were Latino. This is a higher level of representation than we found for city government as a whole, exceeded only by the Police Department (24. percent). The average pay for Latinos was $50,844.54 compared to $53,897.61 for non-Latinos. The number of Latinos earning $100,000 and above was 22, or 11.1 percent of the Latino total. This compares to 88 non-Latinos, or 12.1 percent of the non-Latino total. Latinos made up 24.9 percent of the total staff’s aggregate income. In terms of gender, women made up 52.4 percent of total Latino Council staff, compared to 42.3 percent of non-Latino staff. The average pay of Latina women was $49,648.08 compared to $50,977.99 for the Latino men. Among the non-Latino employees, the average pay for women was $49,625.38 compared to $53,897.61 for the men. This is simply a first cut of City Council personnel data. It would be useful to get a more detailed and publicly available profile of this group of employees to assure that they more or less reflect the population they serve and that racial-ethnic and gender disparity issues are adequately addressed.